The following is a very brief outline of the history of the ORDER OF THE TEMPLE taken from the 1901 Statutes, Laws and Regulations, various papers in The Lodge of Research No. 200 Transactions (by kind permission) and the internet. For a more comprehensive history please refer to the category above entitled "Masonic Literature"
"The United Reigious and Military Orders of the Temple, and of St. John of Jerusalem, Palestine, Rhodes and Malta"
The Order of the Temple, or to give it the full title, "The United Religious and Military Orders of the Temple, and of St. John of Jerusalem, Palestine, Rhodes and Malta" was in a similar position to the Royal Arch in that, even though the "Supreme Grand Encampment" was established on the 25th August, 1836 to govern the High Knights Templar, the Degree was well known to Irish Masons as they had been working the degree for many years. Whereas the Royal Arch Degree was worked under the "authority" of the Craft Warrant, the working of the High Knights Templar Degree was varied. As with the Royal Arch Degree the High Knights Templar degree was worked under the "authority" of Craft Warrants. It was also worked by two Bodies, namely, "The High Knight Templars of Ireland, Kilwinning Lodge", and the "Early Grand Encampment of Ireland", which were independent "Masonic" bodies who worked the Degree with no reference to a Craft Lodge or Masonic authority and were independent of the Grand Lodge of Ireland. There were also Private Encampments (Preceptories) independent of Craft Lodges. The Oldest Recorded Minute of the Knight Templar Degree. The earliest recorded minute in the world of the Knights Templar Degree being worked is from the Minutes of the first meeting of an Irish Royal Arch Lodge meeting under the authority of the charter of St. Andrew's Lodge No. 82 (S.C.) on the 20th August, 1769. The Royal Arch Lodge was formed by Brethren from the 14th, 29th(Glittering Star No. 322) and 64th Regiments in Boston. The Royal Arch Lodge was formed by Brethren from the 14th, 29th(Glittering Star Lodge No. 322) and 64th Regiments in Boston. The Minutes of the first Meeting record the fact that William Davis, a P.M. and Member of Lodge No. 58 in the 14th Regiment, was accepted and "made by receiving the four steps, that of Excellent, Super Excellent, Royal Arch and Knight Templars". The Knight Templar Degree was conferred by members of an Irish Military Lodge, with a travelling Warrant, namely, Glittering Star Lodge No. 322, which is still at Labour (see a Jewel of this Lodge in the Craft Jewel section). The High Knight Templars of Ireland, Kilwinning Lodge. The first body of Knights Templar in Ireland was "The High Knight Templars of Ireland, Kilwinning Lodge". 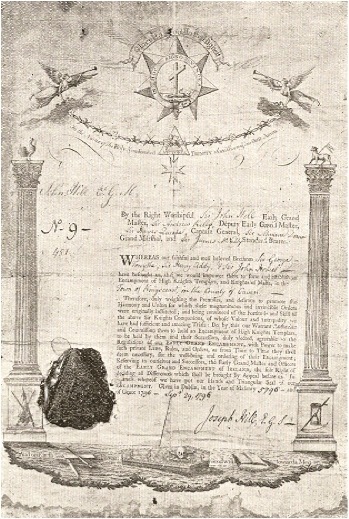 On the 18th October, 1779 Archibald, the 11th Earl of Eglinton, the Grand Master of Lodge Mother Kilwinning, issued a charter for a lodge in Dublin by name of "The High Knight Templars of Ireland Lodge, Kilwinning Lodge". Kilwinning Lodge dated 18th October 1779"
The Mother Kilwinning lodge in Scotland at that time considered itself the Custodian of the High Degrees, even its own Warrant was no more than a Craft Warrant. The High Knight Templars of Ireland Lodge, Kilwinning Lodge, did not issue its first Warrant until 1805 and this appears to be as a direct result of the "1805" Resolutions of Grand Lodge, referred to below. in Finea, County Galway in August 1805. Prior to this first Warrant "Kilwinning Lodge" generally granted permission to various Lodges and individual Brethren to confer the Knight Templar Degree. 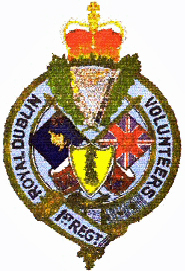 "Rules and Orders of the First Volunteer Lodge of Ireland, held in the corps of Independent Dublin Volunteers, Excellent, Superexcellent, Royal Arch and Knights Templar, No. 620, on the Registry of Ireland. Dublin: Printed by Brother William Rainsford, A.D. 1786, A.L. 5786." Lodge No. 620 had no Knight Templar Warrant, but it was provided by the "Kilwinning Knights Templar Lodge" with a "Dispensation authorizing it to confer the Knight Templar Degree". Knights made by the Kilwinning Encampment were in general superior in social position to those "dubbed" in Encampments on the Registry of The Early Grand Encampment of Ireland mentioned below. The Early Grand Encampment of Ireland. The Early Grand Encampment of Ireland could be said to be the predecessor to the "Supreme Grand Encampment" established in 1836. The date of the formation of The Early Grand Encampment of Ireland has not been established. It claimed in 1805 (at the time of the "1805" resolutions) that it had been in existence for more than a hundred years - there is no evidence to support this premise. It is probable that the Early Grand Encampment was the one of the first established in Ireland, hence its name and assumed superiority over other Encampments (save "Kilwinning"). The Early Grand Encampment not only granted Charters but also exercised supervision over the Encampments on its Register. The Early Grand Encampment appeared to have commenced issuing Warrants sometime in the 1790's. This is suggested by the fact that Warrant No. 4 is dated 30th June 1793 and Warrant No. 9 (issued to Lodge No 451, Kingscourt, County Cavan) is dated 29th September 1796 (reproduced below). 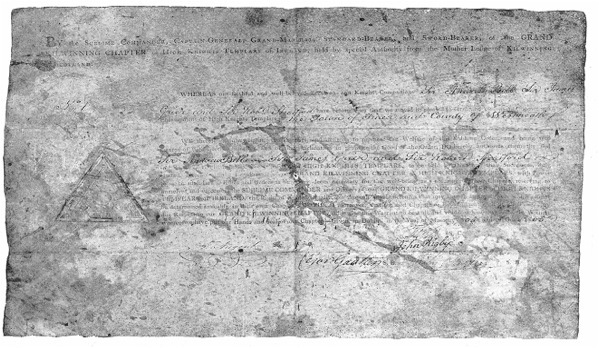 and dated 29th September 1796). In 1805 Grand Lodge proposed to take control of the High Knight Templar Degree. As a result of the storm raised by the Early Grand Encampment, and no fewer than 400 Lodges and Encampments the "1805" resolutions did not bring, at that time, the High Knight Templar Degree under the control of Grand Lodge. However, from what appears to be internal strife within the Early Grand Encampment, its control wained and its last act appears to have taken place on the 24th June 1826 when it renounced its Rights over its Encampments in Scotland. It ceased to exist by 1836. Encampments Independent of Craft Lodges. As can be seen from the above some of the Warrants issued by The High Knight Templars of Ireland Lodge, Kilwinning Lodge and the Early Grand Encampment of Ireland were to Lodges - but there were many Encampments established which were not connected with Craft Lodges nor under the control of any body. "..praying that the Higher Degrees of Masonry - .... shall or may be made subordinate to the Grand lodge of Ireland." A Committee was appointed to the subject but no action was taken. It would appear Bro. John Rigby was a member of the Kilwinning Knights Templar Lodge, (and a close associate of Bro. John Fowler). Above I have reproduced a scan of a 1805 Warrant issued by the Kilwinning Knights Templar Lodge - you will note from an that portion of the Warrant reproduced below that John Rigby was a signatory to same. Bro. 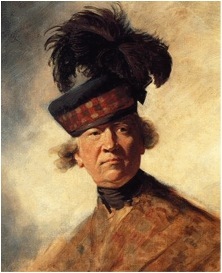 John Rigby, Signatory to Warrant issued by "Kilwinning High Templar Lodge" in August 1805. In 1805 Grand Lodge Resolved to constitute itself into a Grand Encampment of High Knight Templars with a view to issuing Warrants and controlling the Order. Due to the outcry raised (and the "Seton" situation) nothing came of the proposals at that time, however in 1823 the proposal was put forward again. The Proposal at that time came to nothing but it was not forgotten. On the 25th August, 1836 a Grand Convocation of Representatives of such Irish Lodges as held Encampments of High Knight Templars, was summoned to meet in the Grand Lodge Rooms, Dublin. Encampments No's 1, 5, 85, 284 and 888 were represented, and Encampments No's 331 and 957 notified their agreement to the objects of the Convocation. It was resolved to establish an Encampment of of High Knights Templar under the auspices of Augustus Frederick FitzGerald, the 3rd Duke of Leinster (1791-1874), Grand Master (1813-1874), as Illustrious Grand Commander. On the 23rd February, 1837 the first meeting of the Supreme Grand Encampment was held under the presidency of Augustus Frederick FitzGerald, 3rd Duke of Leinster, and since that date up to the present the "Order of the Temple" has been under the direction and government of a Supreme Body. The seniority of The High Knight Templars of Ireland, Kilwinning Lodge, was recognised in that on the Registry of Preceptories it ranks only after the Grand Master's Preceptory (1837) and is entitled "Kilwinning Preceptory" (1838). In 1838 the title "Grand Commander" was changed to "Grand Master". "The Grand Lodge strictly prohibits as unlawful all assemblies of Freemasons in Ireland under any title whatever, purporting to be Masonic, not held by virtue of a Warrant or Constitution from this Grand Lodge, or from the other Masonic bodies recognised by and acting in unison with the grand Lodge of Ireland. 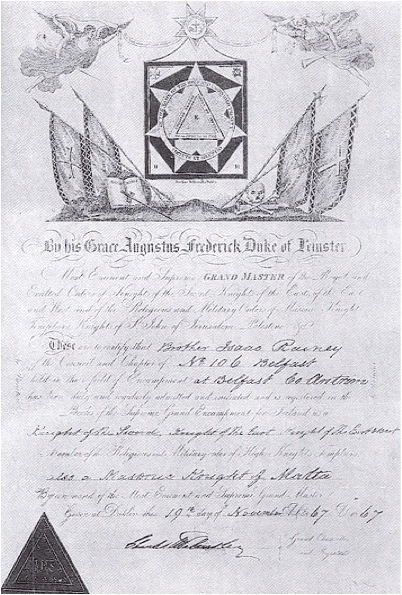 The Lodges are therefore desired to take notice that the Grand Lodge having granted its Warrants for BLUE MASONRY alone, cannot allow or permit them to used for any other purpose whatsoever, and Lodges wishing to work the higher degrees must have separate Warrants to authorize their proceedings, regularly signed by his Grace the Duke of Leinster as head of all grades of Masonry.."
Despite the above it was still many years before the practise of Lodges working the higher degree finally came to an end. This is evidenced by a combined Royal Arch and Knight templar Certificate which issued to Bro. William Dorman on the 13th October, 1866. Bro. William Dorman received the said degrees in Lodge 253 on the 21st June 1866, having been granted them by Lodge No. 43. However as time went on this happened more and more infrequently, until such time as the higher degrees were completely under the control and administration of the relevant bodies. High Knights Templar Seal 1870 - 1903. By the close of the year 1872 the title "Grand Encampment" or "Grand Conclave" had become "Great Priory" as we know it today. I hope the above gives you some insight into the history of the Knights Templar Degree in Ireland. High Knights Templar Seal 1837 - 1869. The High Knights Templar Seal in use from 1837 to 1869 was an equilateral triangle, each side measuring 2.2 inches. The Seal was embossed on triangular black papers slightly larger than the die. The device consists of outer and inner triangular lines, between which are the words, "Supreme Grand Encampt - of High Knights Templars - Metropolis of Ireland." Within the inner triangle are twelve small stars, arranged five to each side, and the letters "I.H.S." in the centre. The High Knights Templar Seal in use from from 1870 to 1903 was circular in shape and 1.5 inches in diameter. The Seal was embossed on red octagonal papers, cut about one-eighth inch larger than the Seal on each side. The device consists of an outer and an inner circle, between which are the words, "Sigillum Militae Christi in Hibernia" and in the inner circle, a horse, on which are riding two Knights with their lances held horizontally. This is a very ancient device, and represents the poverty and humility of the individual members, having only one horse to serve two Knights.